By Hand London created this cool circle skirt calculator app for web use to help work out the measurements for a self drafted skirt for a full circle, half circle and quarter circle skirt. Half and full circle skirts are everywhere on the web but I don’t see many quarter circles. It really is a very easy way to get a nicely fitted dartless a-line skirt, so I don’t know why they are not made more often. I guess when people think “circle skirt” they go for the full and fluffy appeal of the half or full circles. I’ve been meaning to make a quarter circle skirt for ages and decided to give the Circle Skirt Tool a test while I was at it, using a very lightweight 21 pinwale corduroy from fabric.com. You just enter your waist measurement into the tool, choose what type of circle skirt you want, choose the length you want and click “Do the Maths”. The tool them calculates the two radius measurements (waistline and hemline) and works out how much fabric you need. For the quarter circle it calculates it as a single piece with only one centre back seam. 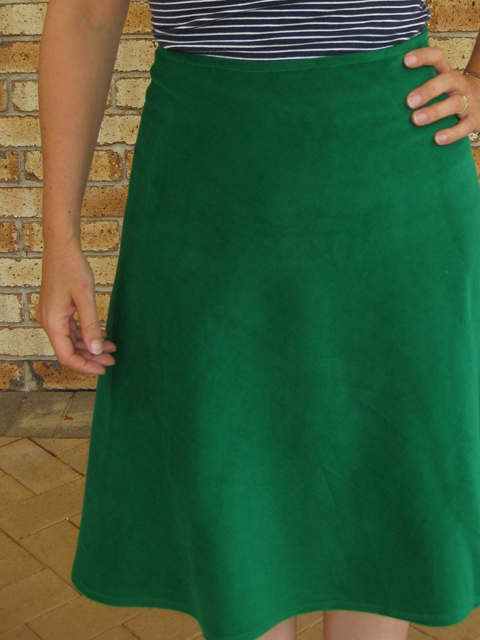 My measurement meant I could fit my skirt on a 43″ length of standard 45″ width fabric. So it was just a matter of sewing up the back seam, adding a zip (I used an 8″ standard zipper in stash and used a lapped zipper method as I love that look). I finished the waistband with a bias trim and finished the hem just by folding it over twice and machine stitching on the right side. A very very easy and quick make. The Circle Skirt Tool calculated accurately according to my measurements and the resulting skirt fits like a glove. Just remember that if you want the skirt to have a bit of ease or sit a bit lower to adjust the waist measurement accordingly. The corduroy has a nap though, a bit like velvet, so at the centre back seam one side is one side is on grain and the other side is cross grain, which makes the two sides look slightly different at the back. Not enough to bother me for this make but next time I’ll make sure I use a fabric where the grain or pattern direction doesn’t matter. I feel that moving the grainline to the centre of each pattern piece results in a nicer hang to the garment. If you just fold your pattern piece in half so that the two side seams line up with each other and crease it down the centre that will give the exact straight of grain for the new grainline. Another lovely option is to cut it on the bias, a good tutorial on how to do this is from Threads Magazine here. Some other examples of the 1/4 circle skirt are as maxi dresses – it makes a particularly lovely maxi length, which I used in my Jaywalk Maxi Dress. Its also a good choice if you want a dartless slightly fuller than straight but not too full skirt and so I used it for for my 1960s Vintage Lace Dress. Other online tools that assist in calculating the radius and fabric length for circle skirts are this calculator here and it also gives the formula and a schematic here. I’ve been on a skirt making frenzy the last couple of months as I have been rushing to repopulate my wardrobe with stuff that actually fits due to slight weight gain. But I think I need to attend to making some nice tops – blouses and tees for a bit – so I have something me-made to wear with my skirts. *This post has been edited April 2016 to include additional clearer images, add in additional calculator tool links and the text has been edited for clarity.